How to add birthday to birthday calendar? – Customer Feedback for YunaSoft Inc.
You can’t directly add birthday to birthday calendar. In fact, birthday calendar is not calendar, it is just field of contact. If you open Contact App in iPhone, and edit contact of a person. You can add “birthday field”. Birthday calendar is collection of “birthday field”. 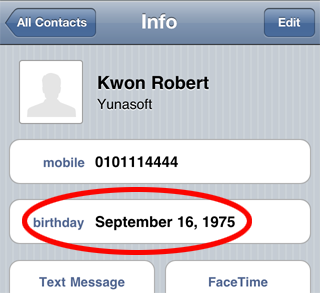 So if you want to add birthday of a person, you should add birthday field in Contact App. Then birthday will be automatically show up in Awesome Calendar.